It’s early morning and everyone is arriving at the noisy childcare centre. Mum is going to work. “Bye, Mum.” What do mums do at work? Are the children as busy as their mums? 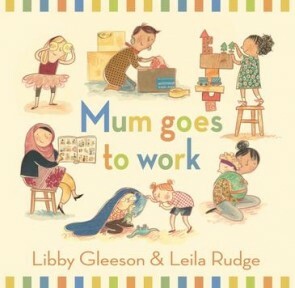 New edition of a groundbreaking book by award-winning Australian author Libby Gleeson with adorable artwork from much-loved illustrator Leila Rudge. It is a reassuring (and fun) book for working mothers and their children. Click here to read more about Leila Rudge. Libby Gleeson grew up in a number of country towns in Australia. She trained as a teacher, but gave it up to travel and to write. She lived in Europe and England for five years, but has since returned to Australia, where she writes full-time. Libby has written more than thirty books for young readers, including picture books, junior fiction, fiction for older readers and non-fiction. Libby’s work has received high acclaim both internationally and in Australia and has won many awards. Her books have been shortlisted nine times for the Children’s Book Council of Australia Awards and Libby has won several times with Hannah Plus One (Fiction for Young Readers Book of the Year 1997), An Ordinary Day (Picture Book of the Year 2002) and Amy and Louis (Early Childhood Book of the Year 2007). Libby received the prestigious Lady Cutler Award for Services to Children’s Literature in 1997. Leila Rudge was born in England and grew up making mud pies with six siblings and Jeni from number 15. After completing an Illustration Degree at Bath Spa University, Leila headed to Australia to seek her fortune (and the sunshine). Creating tiny characters for books is her favourite part of illustrating. ‘Duck for a Day’ has been shortlisted for the 2011 CBCA Book of the Year Award – Younger Reader’s Category.